Aargh you ready for a little Disney fun mateys? 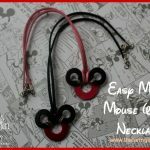 Create your own pair of Pirate Mouse Ear. 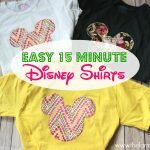 This craft is perfect to make for an upcoming trip to Walt Disney World or sailing on the Disney Cruise Line. Ahoy mateys. 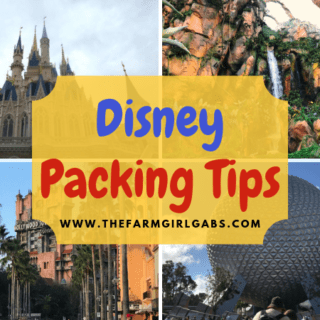 I am back today with another fun (and pretty darn cute) Disney craft. I initially made these Pirate Mouse Ears to wear at the Pirate Night Party when we set sail on the Disney Wonder back in February. I’ve been holding out on you a little in sharing this tutorial with you. 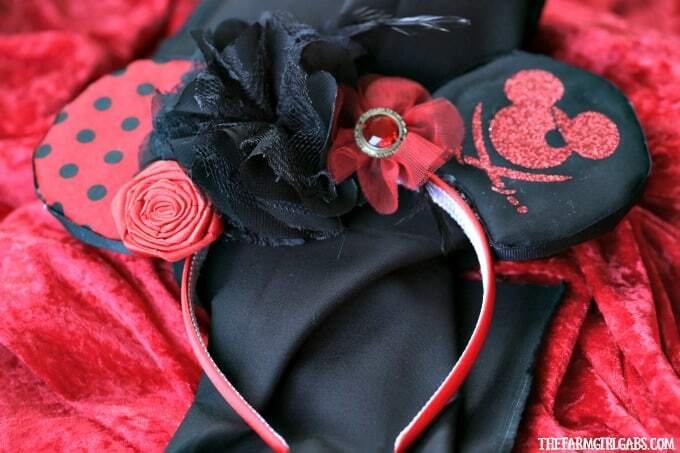 They are not only the perfect way to rock your Disney side while visiting the parks or aboard one of the Disney Cruise Ships, but also a perfect way to celebrate the upcoming release of Pirates Of The Caribbean: Dead Men Tell No Tales on May 26th. Not going to lie, I love me some Captain Jack Sparrow. I am counting down the days until the movie’s release. Begin by downloading the Mickey Ears template. Trace and cut one ear for each color fabric. 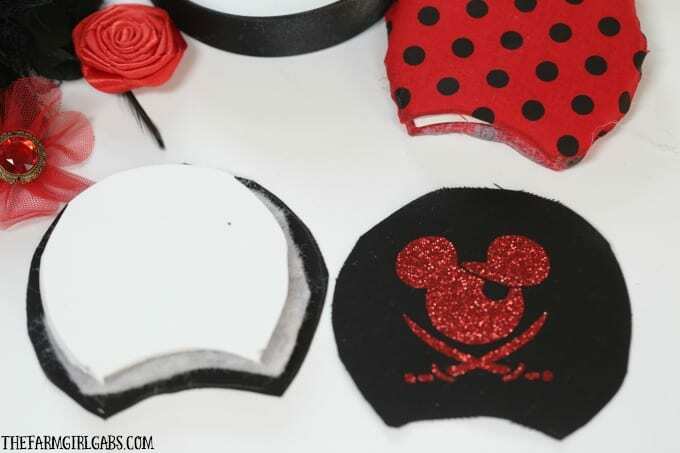 If you have a Silhouette machine, download and print the Pirate Mickey cut file onto the red glitter iron on transfer paper. Iron on the cut piece onto one piece of the black ear. Using the smaller Mickey Ear template, trace and cut two pieces on foam board. Repeat with the batting except you will need four pieces. Assemble each ear as shown above. Use hot glue to secure each side of the ear. To finish off each ear, glue a piece of black ribbon around the outside of each. Glue the ears to the headband. Add the flower embellishments. Now you are ready to rock your pirate Disney Side at the parks, on the ship or at the upcoming Pirate of the Caribbean: Dead Men Tell No Tales showing.